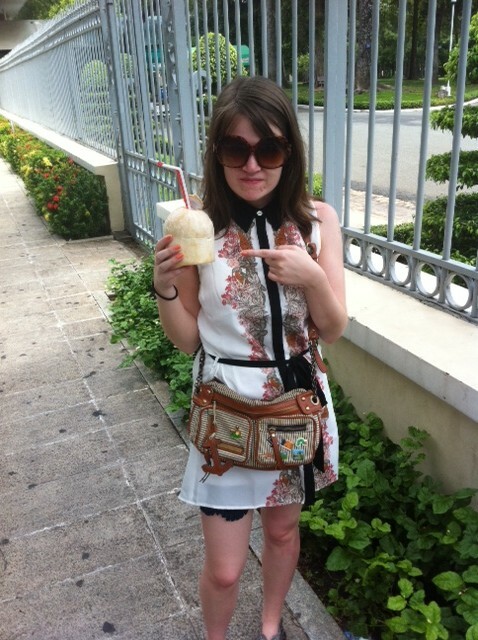 The next destination on our trip was perhaps the one we were both most excited about – Vietnam. We were headed to Ho Chi Minh City and as the plane lifted off the runway the pilot announced that we were bound for Saigon. Wait, what? In a brief moment of panic, I was certain we’d got on the wrong plane until I remembered back to my High School music lessons of watching Miss Saigon and was reassured that wherever Saigon was, it was at least definitely somewhere in Vietnam. So as the plane continued its journey I was able to relax with Miss Saigon show tunes playing through my head all the while. I’ve now corrected my ignorance and understand that Saigon and Ho Chi Minh are the same place, the latter being given as the new title after the Vietnam War. 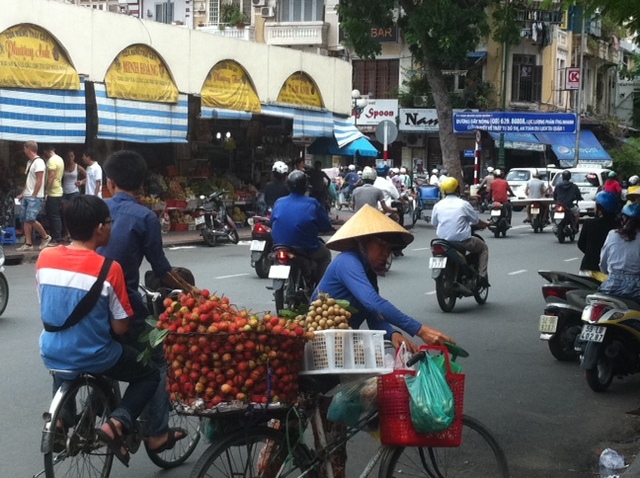 During my time there I found that Saigon was used just as often as Ho Chi Minh. When we arrived at the airport, we had to collect our visas before proceeding through passport control. The visa process for Vietnam can be quite time consuming and a few weeks before we’d already had to file some paperwork stating our itinerary. Without this paperwork you won’t be granted entry and will be sent straight back to where you departed. There’s a further visa process at the airport that involves filling in more paperwork and sitting around for an hour without being told what’s happening or if the visa is going to be granted. There’s also a rough exchange of 45 American dollars per person and an additional 10 dollars for a passport picture, if you’ve forgotten to bring one. It’s worth noting that for $90 you can get a visa before arriving but that involves posting your passport to the closest embassy which I wasn’t too keen on. After the hoopla we were called to the desk and given our visas, just behind a guy whose visa had been clumsily stamped into someone else’s passport. On the way to the hotel I looked out of the window in amazement as scores of motorbikes drove past, some with whole families on them. Traffic was very slow moving and we were surrounded by motobikes and scooters as far as the eye could see. On arrival, I was delighted to find the hotel was right next to a bustling market known as Ben Thanh which sells a plethora of goods with everything from from fresh fruit and traditional cuisine to fake designer clothing. The market was such an experience filled with the smell of fresh flowers and spices and the promise of a good bargain. Like Thailand, touting is also very popular in Vietnam and some of the sellers were extremely pushy, to the point I very nearly bought a durian, a fruit which I absolutely detest. 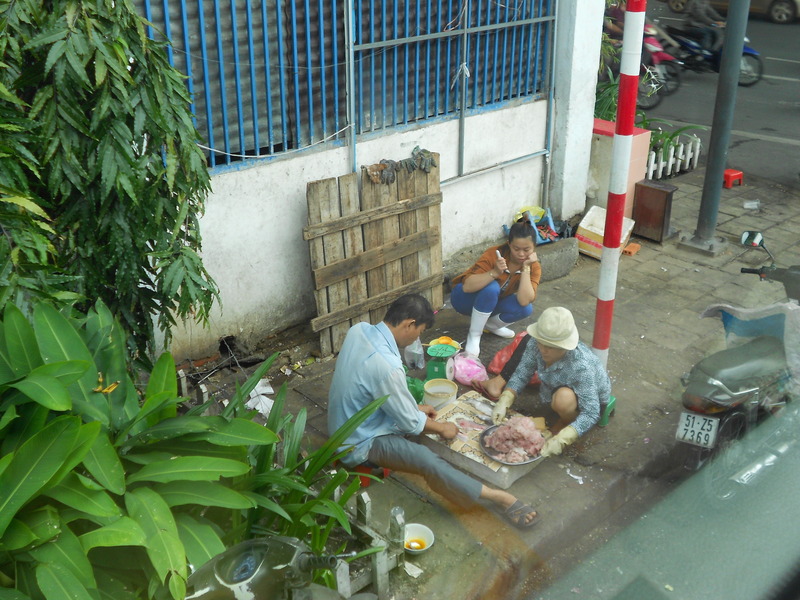 The thing I loved most about Ho Chi Minh was that it felt so alive. You can see all aspects off everyday life just by walking around the block. 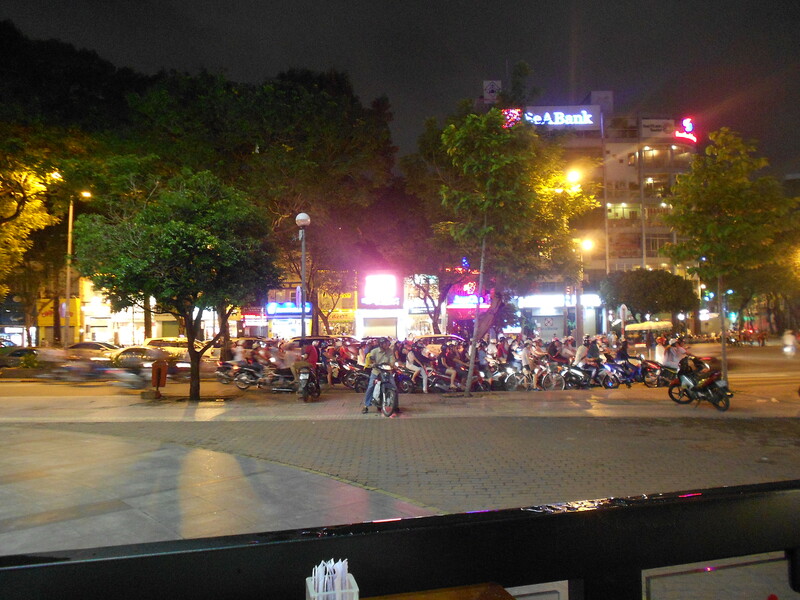 At night, you can see families enjoying dinner and drinks sitting on the street with low plastic tables and chairs. By day you can experience restaurant staff washing their dishes outside with huge metal washbasins and preparing food for the next meal. It was also interesting to see luxurious designer shops nestled in with little independent businesses selling old bits of radio and scrap metal. A glimpse of everyday life in ‘Nam. As I mentioned before, there were people ready to tout their wares at every opportunity and a lot of our time spent in the city involved dodging such “bargains”. Unfortunately Gavin was outwitted by a coconut seller and coaxed into parting with 50,000 Vietnamese Dong (only about £1.20) for a chilled coconut. There seems to be an unwritten rule that if you take any piece of advice from a seller including something as unassuming as “Hello. Are you going to the park? It’s that way”, you are expected to part with a little bit of cash. Looking less than impressed with the offending coconut. 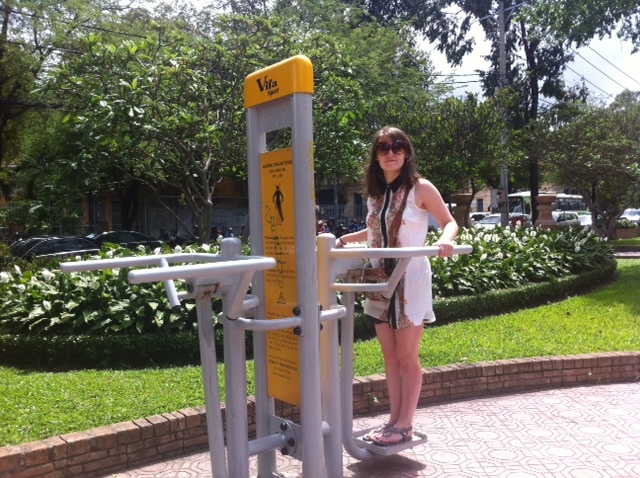 Walking around the city there is just so much to see, I was especially impressed with an outdoor gym including exercise bikes and an exciting swing-like contraption that asides from being jolly good fun keeps your arms and waist trim with every swing. My stint at the gym was interrupted by a huge rat that scuttled past me and into the bushes. It was time to move on. A free outdoor gym. What a brilliant idea! Gotta love a bit of socialism. 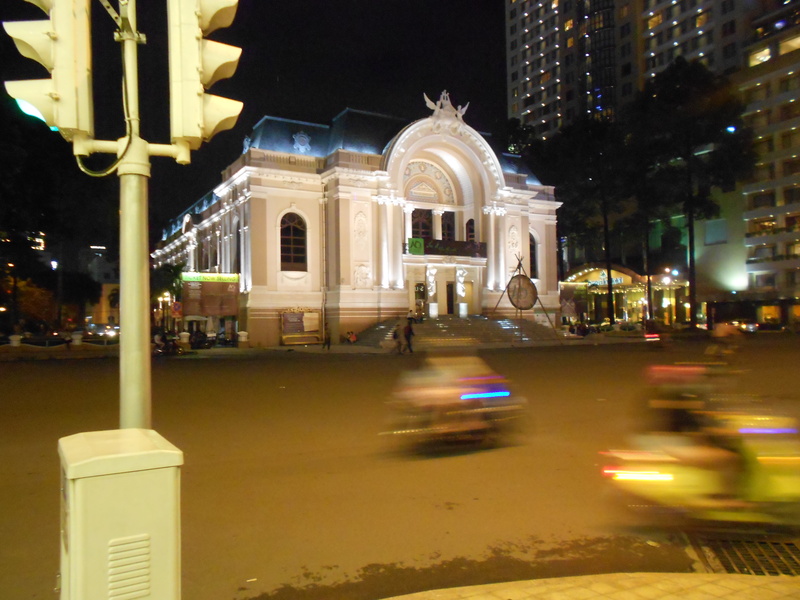 We spent most of our time in Ho Chi Minh walking around and exploring what they city had to offer. The Disney-esque city hall was pretty impressive. It was hard to take a shot of anything without motorbikes whizzing past! 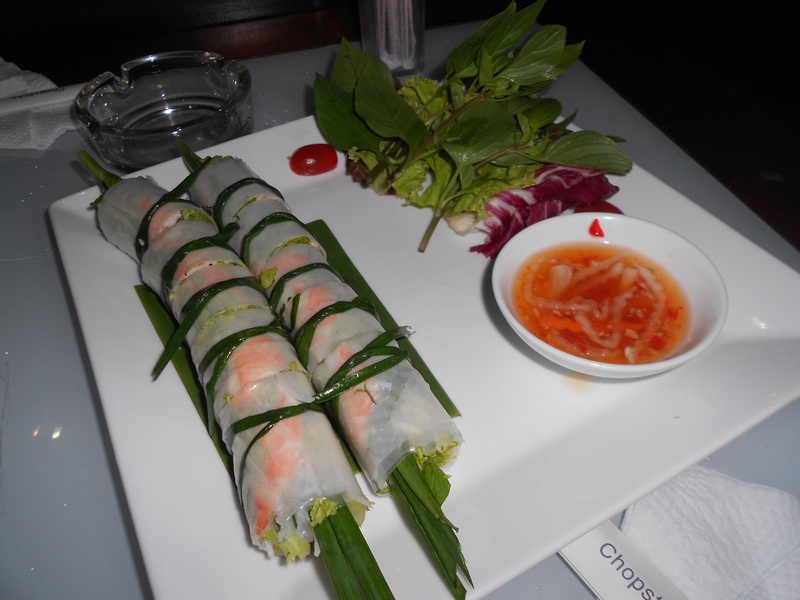 Some tasty Vietnamese spring rolls. 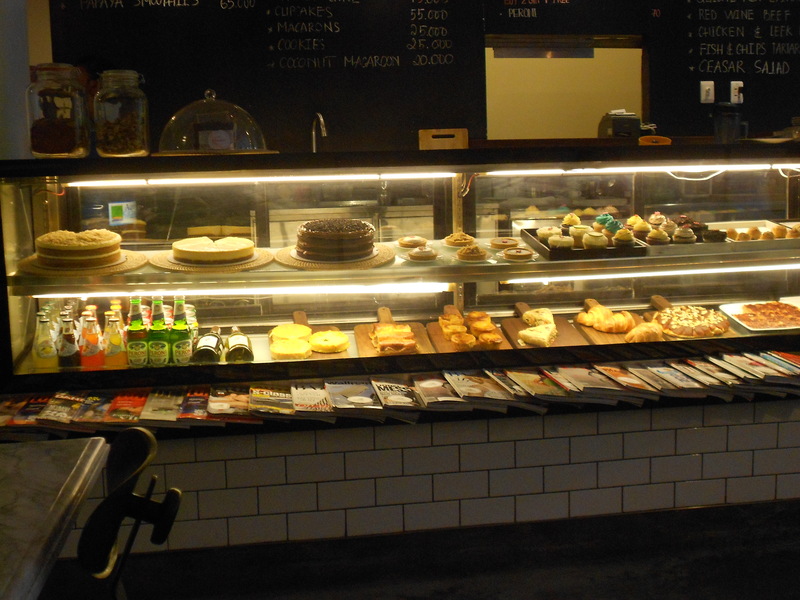 We found a little independent cake shop with a British twist, offering fish and chips amongst other tasty treats. On our final evening in the city we enjoyed an evening at the rooftop garden of the infamous Rex hotel. 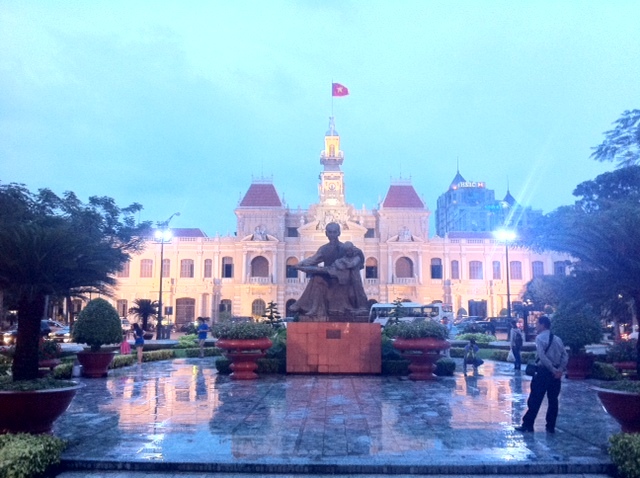 Built in 1927 this gorgeous building, like so many in Vietnam is a reminder of its French colonial past. The hotel is like a tardis and it takes you on a charming trip back to the mid 20th century where the faded glamour is still very much alive within its walls. Supping on delicious cocktails we were treated to an amazing flamenco band who performed everything from Hotel California to the unforgettable classic Viva Forever by the Spice Girls. There was even a Russian Cossack dance thrown in. From our seats, the city lights and buzzing traffic contrasted with the rococo style of the Rex offered an insight into a city that’s moving forward but still allows itself a nod to the past. 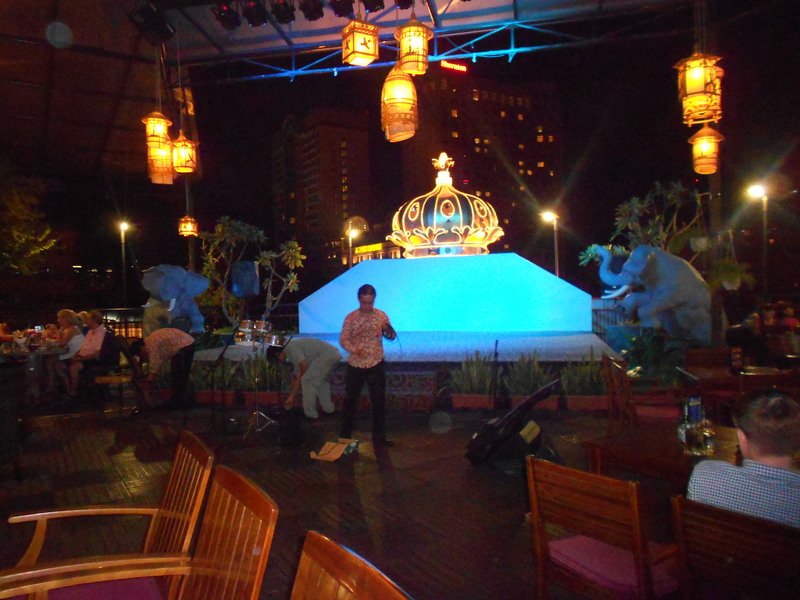 The band packing up for the night with the iconic Rex crown as their backdrop. Part of me wished the band would never stop playing and I could sit for just a little longer to enjoy the fleeting look into a bygone era. But there was one more adventure to look forward to, as the next morning we were moving on to our final destination, to a beach resort in seaside town Mui Ne.